How has your week been? Mine was a little hectic but it's good to be back in the swing of things after the craziness of Spring Break and then the following week catching up from Spring Break. I actually was able to do some real couponing in today's trip and I am finally feeling like I am back on track with coupon organization and grocery planning. I wanted to make it to Target this week to see our newly renovated "Fresh Grocery" store but it didn't happen and I am hoping to go this weekend. 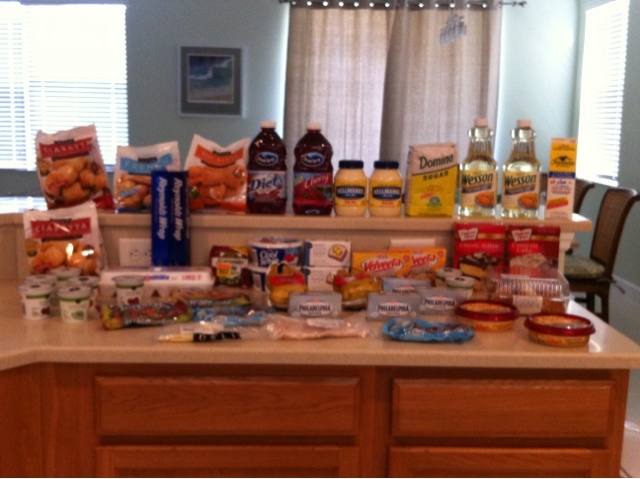 Today's Publix trip was my only shopping this week and it was a pretty big trip. This week's Publix ad lasts until Easter Monday so I broke up what I wanted out of the sale and bought some this week and will buy some next week to spread it out with our weekly shopping budget. I didn't find any good deals on fresh veggies this week so we will either eat what we have in the freezer (which is a ton) or swing by the local produce stand. Today I finally was able to stack one of my $5/$50 Publix coupons with a $5/$30 Winn Dixie coupon from Enjoy the City because for the first time in a long time I hit $80 before coupons. That really helped with today's total since even after coupons and sales I ended up spending a little more than our targeted $50 a week and saving about 63%. Don't forget to link up your weekly totals/shopping trip posts below and if you have a food blog come back on Monday for my first Mealtime Monday recipe link up! I can never have enough butter and this is a great price, I just stick it in the freezer till we need it. Click below to link up to your weekly totals or shopping trip posts! Hey there Kaylee, I love your blog, I get wonderful recipes and tips, I gave you the Liebster award, come on over to my blog to see what you have to do.